A bit of Cowgirl history to start….. The Cowgirls all female team have been making an appearance at Geoquest since 2005, and that being our first year we raced the Half course and were vaguely confident we could achieve the distance. Things were a bit different back in 2005 – we had an ocean paddle (just like the Full course), we had to copy the CPs onto our maps via co-ordinates (eastings/northings) and we had to contact the maps as well. This took a lot of time in map preparation. Things are so much easier now! Getting back to that original team in 2005 – it consisted of some great females in adventure racing. Kim Beckinsale, Thorlene Egerton, Susie Blissner and yours truly to make up the 4. We had no goals in that event other than to complete it as a happy team. As it turned out we won the race outright – we were in shock to say the least….. The all-male team that we came in ahead of had chided us for drinking red wine the night before the event – they soon learnt this was a good strategy…..and we learnt that too….so have continued on the tradition for many years since! 2005 – on the beach ready to start – what were we getting ourselves in for?? 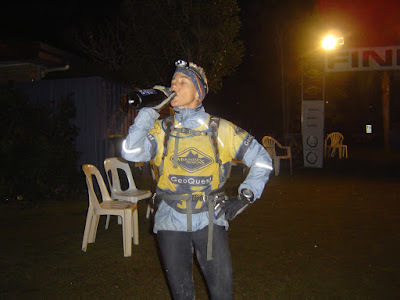 Moving on the 2006 – where do you go when you win the GeoHalf? No other choice but step up to the Full course. 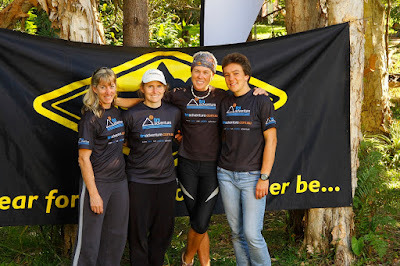 We put together another great team – Janie Cooksley, Wendy Read, Kim Beckinsale and yours truly. 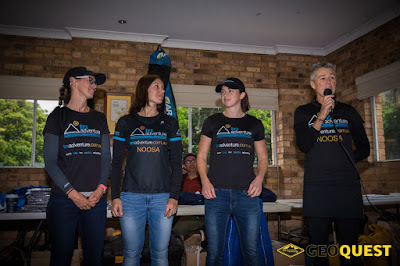 This race had the infamous hike-a-bike up Mt Yarrahapinni – the toughest one ever – and we Cowgirls had a 20-minute sleep half way up as we were struggling big time. 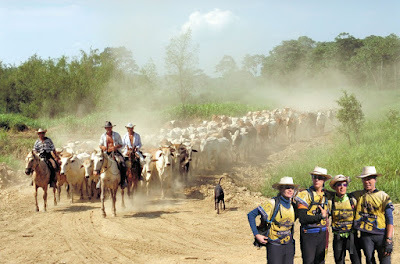 This race was one of the longest ever as well – the winning team took 37 hours and we Cowgirls finished the whole course when half the field retired or were short-coursed. There was a 1.5km portage option on the paddle down the Nambucca River – but we couldn’t lift our titanic sea kayaks – so ended up paddling and extra 10kms around. We kept ourselves awake (as we were now into the 3rd day..) by singing very loudly. We found every CP but it took us nearly 53 hours – so we had missed the presentations when we arrived in on Monday morning! This was truly an epic adventure with some truly amazing women…. 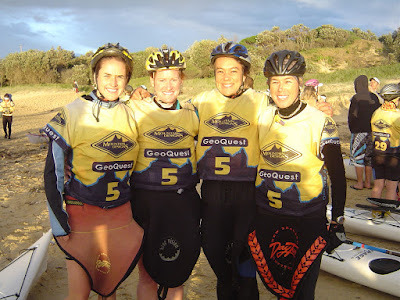 2008 – I had Thor, Tamsin and Alison Curtin in the Cowgirls that year. We survived the ocean paddle once again. It was another great experience and we finished in about 42 hours with champagne on the finish line at 2.00am – yee-ha! Thor, Alison, me and Tamsin line-up for 2008! Nothing like champagne straight from the bottle at 2.00am! 2009 – This year Geo was in Forster. 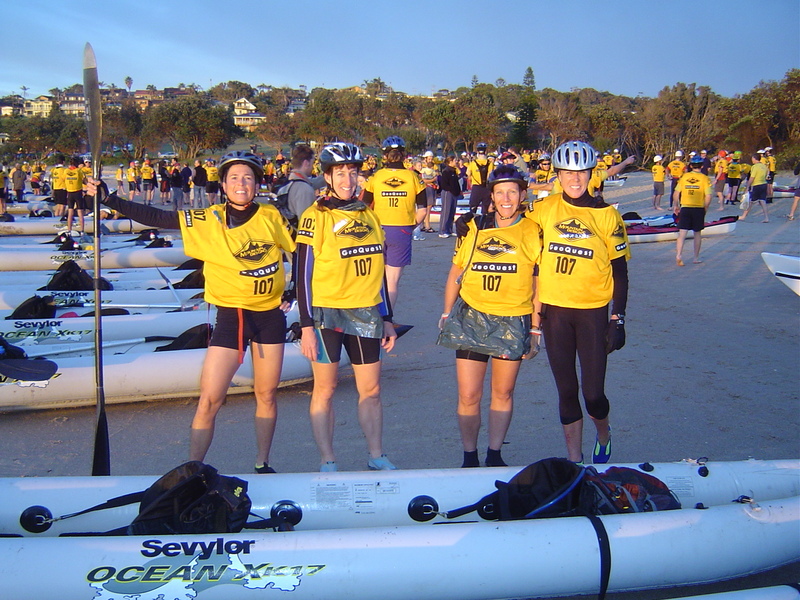 We had another gun team – Kim, Narelle Ash, Wendy Read and me (actually, I wasn’t a gun at all, I was 49 and getting rather slow…). This was the year we had to construct a raft – it was probably one of worst legs in AR that I have ever done – Cowgirls are not known for their engineering prowess! I think we were on that raft for 5 hours drifting around the Myall Lakes – not something I wanted to repeat again in a hurry. Unfortunately, we had to retire that year as one of our team-mates developed hypothermia and we couldn’t revive her. We still raced for 40 hours…..so got plenty of time on the course. 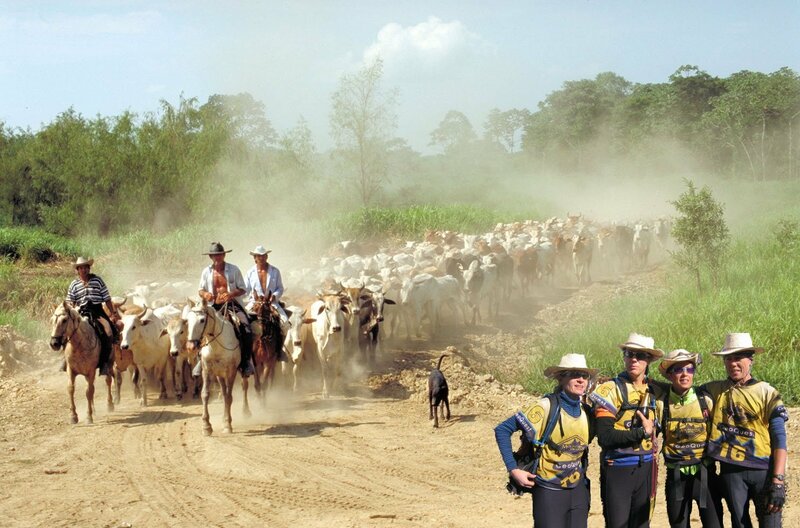 In the years since then the Cowgirls have been firmly ensconced in the Geo Half. I have had some amazing girls come through my team and demonstrated to them what girls can do on their own. Lee Burgess, Julie Drysdale, Diane Croft, Mandy Caldwell, Susie Blissner, Gina Dunsdon, Michele Krome, Wendy Flanagan, Kelsey Harvey, Linda Thompson, Cass Kimlin, Shan McGrath, Abbey Anderson and Kelly-Anne Speight – you are all extraordinary women and I hope you are proud to have been part of the Cowgirls Tri Adventure……as I have been so pleased to have you on board! Not one cross word or one complaint has been made from these girls over the course of 13 years…..and no tears either…..pretty incredible I think! 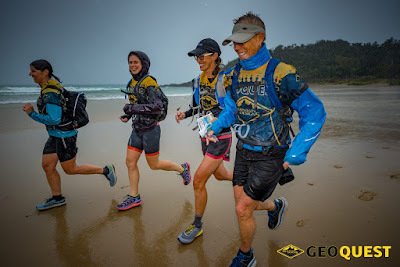 The east coast low had brought the rain to the mid-north coast (as it did in 2011 when the event was eventually called off..) and we were faced with another critical situation where the race director had to make hard decisions for the safety of the competitors. A few sections of the course were cancelled, including our only paddle! This meant we had about 43kms of trekking and 60kms or riding. There was no question our legs were going to suffer! We started at Coffs Harbour with a 13km beach trek and one CP to collect along the way. To my surprise we ran the whole way on this foot leg – that would be the last time we ran until the last 500m! There was one rather challenging section on this beach where we had to make a quick sprint around a rocky section or be sucked out to sea with the crashing waves. We all made it – but some were a bit shaken by the experience! It was bucketing down rain (repeat this phrase for 18 hours…) when we hit the TA and our crew fawned over us - a thousand ‘thank-yous’ Steve & Michele! Our first bike leg was 38km. It took in some roads and many slippery trails. 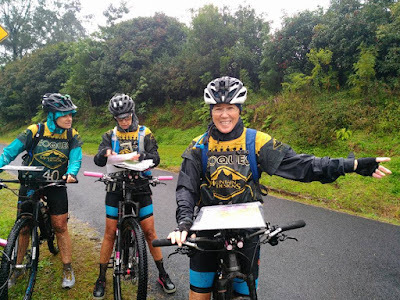 We handled it like Cowgirls – slow and steady – looking after each other all the way – especially on the slippery downhills! At the next TA our crew had ham and cheese toasties – thanks again Michele and Steve – this was awesome! We trekked off in the late afternoon and were hoping to bag the first of 3 CPs in the daylight – we didn’t quite make it but it was an easy walk into the creek junction to punch. The next 2 CPs were on tracks – so we walked right onto them…..and then we had to tackle a massive uphill to Peak Trail (thanks for the tow Kelly-Anne!) and then the long slippery downhill to the road. Kelly-Anne was brilliant at this and she went ahead and helped us pick the easiest way down. We slipped and slid…..mostly on our feet, a few times on our backsides….but made it to the bottom eventually – with a sigh of relief! Our crew had Mandy’s split pea soup on offer here – Yum – I didn’t think I could make it as well as Mandy, however it was delicious……but we had to do the archery first and this was a bit of a challenge! Shan proved to be the best – getting 3 shots in, the others were good too – they got one each – I was absolutely hopeless – missing every one – not sure how I come from family with a champion bow hunter father…..sorry Dad!! We were on the bikes for the ride down to Mylestom – and the knowledge that we would be finishing early spurred us on. At this point we were passed by the some of the Full course teams – had a little chat and they left us in their dust (actually that would have been mud…). 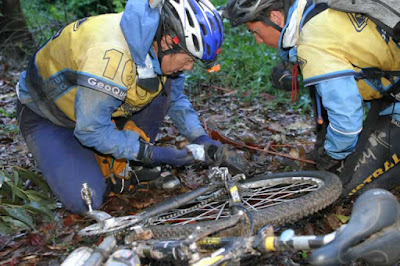 We did have a small bush-bash with our bikes to find the inland track and then sped into the TA, had a super-quick change of shoes, donned our Gore-tex pants and off we went. Did I mention it was raining? Um….well, yes it was. It absolutely bucketed down again on this trek. We walked quickly, however the lights of Sawtell in the distance didn’t seem to get any closer! After what seemed forever, we reached the outlet of Bonville Creek which we had to cross to get to the finish line. It was a raging torrent of flood water. There were about 6 other teams milling around wondering what to do as it looked terrifying and completely unsafe and no-one was game enough to attempt the crossing. I was keen to get across, and we watched a Full course team arrive (with a very tall man), link arms and head into the water. They seemed to drift a little and then got their feet onto land again and they were over. Ok, Cowgirls, we have to do this….so off we went with one of the other teams. We stuck together until we started to float, Kelly-Anne was strong trying to keep us from floating away and, just when it seemed like it was all going pear-shaped, we got our feet onto hard surface and dragged each other up to the shallows. We were all a bit shaken – especially Shan – but we had made it and only had 500m to go to the finish line! That’s when I decided to ask my body to run – and it agreed – thanks old body! I did hold onto Shan’s pack to keep us together and we ran up the beach reflecting on our race. It had been very tough – it always is – and it gets harder every year for me – but I am a stubborn old thing! We had been the perfect team – everyone worked well together and we laughed and chatted a lot but then were comfortable in the silences as well. 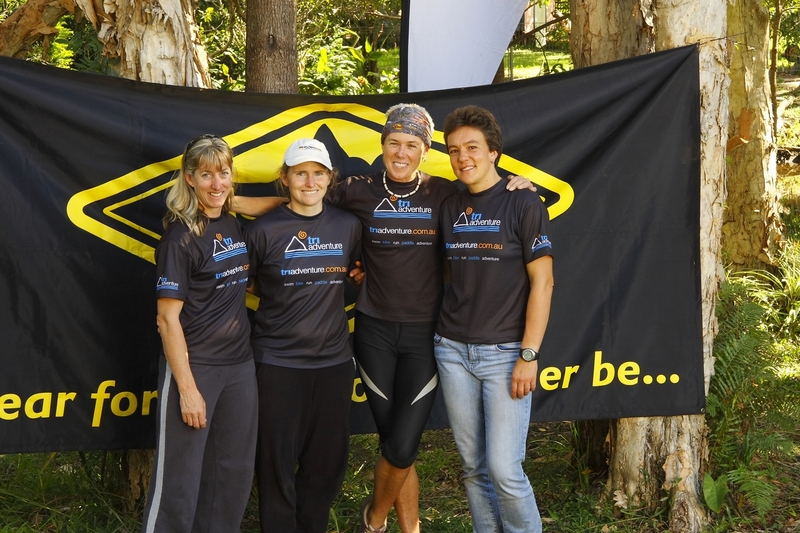 We had looked after each other too - this is what it’s all about – and come home happy and proud of our efforts as 4 females in a very challenging event – and 1st female team J…. The Cowgirls have been doing this since 2005 – getting women out there together, driving our own event, carrying the gear, making the decisions and finishing up with a bond that you can’t really describe to anyone who hasn’t done this. Thanks to all the Cowgirls over the years – you have been awesome – and hopefully we’ll ride again for a few more years to come. Yee-haa! !